Having said that, these remarks criticize only police officers who acted disrespectfully at Officer Ramos’ funeral. 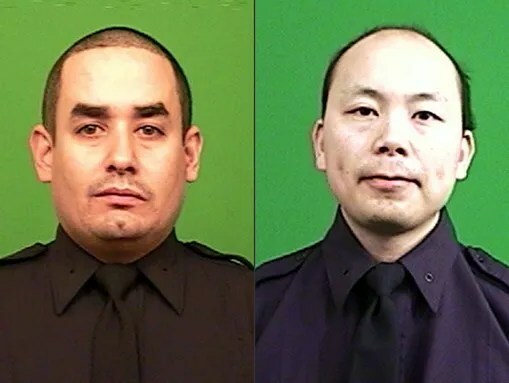 Officer Ramos and his partner, Wenjian Liu, served well and in good faith. In a ceremony intended to celebrate Rafael Ramos’ life, Ramos and his family deserved better than they received from fellow officers determined to demonstrate their displeasure with the city’s leader. As de Blasio spoke, hundreds of officers outside the church turned their backs in a sign of disrespect. Some have said de Blasio contributed to a climate of mistrust toward law enforcement amid anti-police protests. At a hospital after the Dec. 20 shooting, the police union’s president, Patrick Lynch, and others turned their backs on the mayor. Lynch blamed the mayor then for the officers’ deaths and said he had blood on his hands. 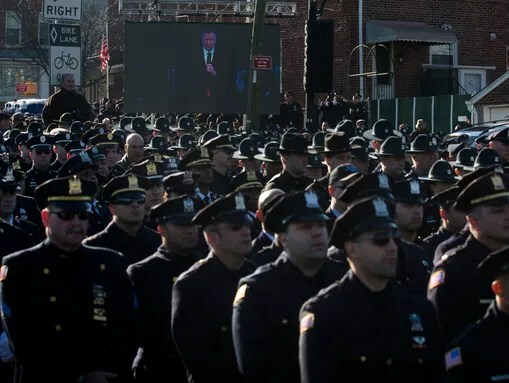 Police officers turn their backs as New York City Mayor Bill de Blasio speaks at the funeral of New York city police officer Rafael Ramos in the Glendale section of Queens, Dececember 27, 2014, in New York. For the policemen who turned their backs, their act was a form of counter-protest. St. Louis football players come out on the field with their hands up? People march to honor Eric Garner, and to object to his treatment at the hands of New York City police? Mayor de Blasio says the protesters have a point, that we need to prevent future killings? We’ll show him what we think of that! If the mayor doesn’t stand with the police, he’s an enemy! He’s certainly not fit to lead us. We will publicly disrespect him to show our displeasure. No evidence exists to indicate that Officers Ramos and Liu died as part of an anti-police backlash after the Ferguson and New York City protests. No evidence indicates that the person who shot them, Ismaaiyl Brinsley, harbored motives related to the manner of Eric Garner’s death. He shot and wounded his ex-girlfriend, he shot and killed two police officers, then he shot and killed himself. We don’t know why. For police officers attending Ramos’ funeral to act disrespectfully, as their leader eulogizes a fallen hero, disrespects their brother in blue and the mayor. From what I read about Rafael Ramos, he would certainly not want fellow officers to act dishonorably toward the city’s mayor, who came to pay his respects both to Ramos and to his family. When someone comes to pay respect, you accept it. This profound act of discourtesy shows the determined mindlessness that lies behind the public positions police take when they respond to the aftermath of Michael Brown’s and Eric Garner’s deaths. They admit no mistake. They maintain that everything Officers Wilson and Pantaleo did in these two cases correctly follows established procedures. They insist they would act the same way again, in similar circumstances. In so saying, they deny legitimacy and validity to the grievances that protesters in Ferguson and New York City bring to their assemblies. They do not recognize the people who object, nor do they grant that the protesters’ objections deserve a hearing. They defend their actions, and act as if they have done nothing wrong, either in the Brown or in the Garner case, or in hundreds of similar killings that bring protesters together. Police have a lot to gain, and little to lose, if they recognize protesters’ grievances. They want the people they serve to trust them. Right now, the people they serve do not trust them. If they continue to stand against the people they serve, if they continue to stand against leaders like de Blasio who support people who have legitimate grievances, their authority will deteriorate even more than it already has. Authority rests on trust, not force. New York City police officers are protesting by refusing to work. It’s not the first time.